“But Will They Eat a Yo-Yo Jig? BUT WILL THEY EAT A YO-YO JIG? According to the article published in Seafood Source.com on March 7, 2014 (http://www.seafoodsource.com/en/news/aquaculture/25678-new-farmed-yellowtail-hits-us-market), these forkies are being formed right in Baja out’ve Bahia Magdalena. Yes, real yellowtail ranches! “California-based seafood distributor Catalina Offshore Products, and Baja Seas have partnered to bring a new farmed yellowtail to the U.S. market. Baja Seas will officially introduce its Baja farmed yellowtail, also known as Baja hiramasa, at Seafood Expo North America in Boston on 16 to 18 March. Catalina Offshore Products has been test marketing the fish and it has already appeared on menus in from San Diego and Chicago. The original stock was bred for Baja Seas from fingerlings produced at Hubbs-SeaWorld Research Institute. The fingerlings were transferred to Baja Seas’ grow out facility on Bahia Magdalena, a bay in southern Baja California. Future seed will be sourced from Baja Seas’ own hatchery, Ocean Baja Labs. Baja Seas uses Recirculating Aquaculture Systems (RAS) to create a small water footprint by diminishing pollution and disease; fish are fed sustainable protein- and omega-rich meal derived from sardines in a low Fish In-Fish Out (FIFO) ratio; the fish are raised without antibiotics or paraciticides; and semi-automated feeders and feed cameras prevent overfeeding. It sounds like a good deal. I like eating yellowtail. I like catching yellowtail. I don’t know about the taste, but I have a feeling that the wild fresh stuff is gonna taste a lot better. I know wild salmon blows away farmed salmon. But, I’m pickier than most because I grew up on Pacific coast fish. But, most folks I know wouldn’t know the difference. I doubt that 90% of those ordering yellowtail in say, Red Lobster in the mid-west, would know the difference between wild or farmed yellowtail either. It’s probably going to taste just dandy to them. Just like my friends from Montana and Idaho and Wyoming who are hunters. They can tell the difference between wild elk and ranch-raised elk meat. To me, it’s just good eating! However, if there’s a viable way to take the pressure off the wild stocks so us sportsfishers can still throw an iron or dropper loop a bait yet help meet the demand of the market, I’m all for it. Win-win! I’m especially interested in the aspect of this “farmed” yellowtail (no pun intended) if they’re raised with a small ecological footprint. Not using additives and anti-biotics in their food means the “fish poo” (excuse my Spanish), isn’t polluting the water. That has been an issue in other aquaculture situations. Especially, since fish eat a tremendous amount of food to grow. What goes in…has to come out! Additionally, if they’ve found a new way to feed these fish and NOT deplete the local bait situation, that’s a major plus for anglers. No bait…no fish! No fish…no fishing! I talked to an amigo of mine, Scott McKenzie, Director of Quality Assurance at the huge American Seafoods in Seattle WA. Scott is also an avid Baja angler. “The vast majority of Yellowtail consumed globally is farmed. 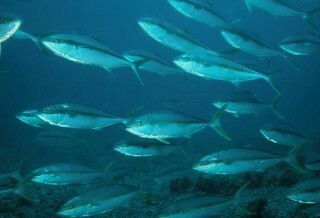 Most of the farmed yellowtail comes out of Japan, with some small production in Australia and New Zealand. From what I’ve heard it is typically a 5:1 feed fish, meaning 5 lbs. of feed to return 1lb of fish weight. Not the most ideal species to farm with regard to feed conversion rates as those are typically down around 3:1, some are even down close to 1:1 these days. One of the unsavory part of a lot of these farmed fish operations is they are often using low trophic species as the feed (sardines, mackerel, menhaden, anchoveta,…). The feed coming out of global fisheries that are nothing more than rendering fisheries ( primary products being fish oil, meal) rather than a by-product of a food fishery. In a nut shell, the ocean gets stripped of bait fish to be converted into feed for a farmed fish somewhere around the world. The world is growing. There’s more people to feed. Yet, we want a balance with our recreational activities. Everyone has an interest and a stake in things. It will be interesting to see how it plays out. I wonder if farm-raised yellowtail can be released into the wild? I know they do it with salmon! And, I for one, wouldn’t mind giving it a whirl on my dinner plate too!